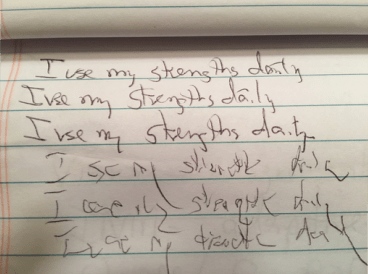 We were asked to write the phrase three times as quickly as we could, “I will use my strengths daily.” Then he asked us to switch to our non-dominant hand and write the same phrase three more times. Here’s the result. Not only was it indecipherable, but it took me three times as long. It was a stark way to address the question, “Should leaders focus on their strengths or weaknesses? Last week Bishop Grant Hagiya invited the newly elected bishops in The United Methodist Church in the United States to lead from their strengths. Gallup research proves that people succeed when they focus on what they do best. People who use their strengths every day are six times more likely to be engaged on the job than those who don’t. 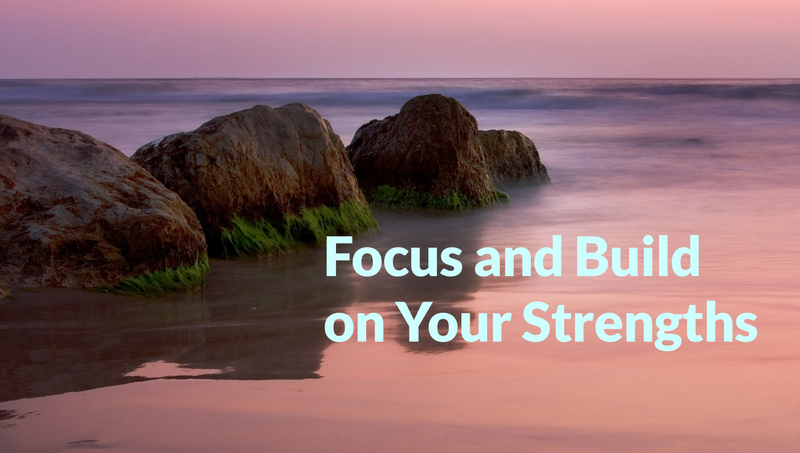 In addition, teams that focus on their strengths are 12.5% more productive. Many people are tempted to believe that if they only acknowledge their weaknesses and work hard to fix them, they will be more successful. The reality, however, is that not all skills and behaviors can be learned well. For instance, some people, like me, are not mechanically inclined and will never become experts in technology. Others are not naturally athletic and will never be Olympians. We may be able to improve our weaknesses to a point, but the effort expended is better used to enhance our strengths. Jack Zenger, bestselling author who writes about leadership development, says, “The supporting evidence and logic behind the development of strengths is based on several factors. Research by Joe Folkman on 24,657 leaders who participated in 360-degree feedback assessments and who each had at least seven respondents showed that regardless of how much effort they spent on correcting weaknesses, their efforts would only bring them to the midpoint on the overall bell-shaped curve of effectiveness. Bishop Hagiya had the new bishops complete the Clifton StrengthsFinder Assessment. In this assessment tool, there are thirty-four strengths in four different domains of leadership: Executing, Influencing, Relationship Building and Strategic Thinking. None of the thirty-four strengths are better than the others. Yet among our fifteen new bishops, five strengths were identified more often than the other twenty-nines. Learner: Leaders with this strength are curious. They are always asking questions and have a hunger for knowledge, growing and continuous improvement. Achiever: Leaders who are high achievers are not always the most intelligent people, but they work harder than others. Achievers are wired for effort and cannot go to bed without finishing their to-do list. They are very productive with time and are likely to “eat the frog.” That is, they tackle the most difficult projects first every day and know how to get things done. Strategic: Leaders whose strengths are strategic see the big picture, anticipate challenges, consider all options and make wise decisions. They are always asking, “What is my next move?” and stretch their thinking for the future. Belief: Leaders for whom belief is a high strength are characterized by integrity, honesty and transparency. Acting out of their purpose and core values, they are intent on seeking God’s will and doing the right thing. Connectedness: Leaders who are strong in this category understand the value of building a network of relationships. They intentionally connect with their colleagues and communities in order to maximize their effectiveness in mission, outreach and evangelism. The most interesting part of the StrengthsFinder process was discovering that one of the other new bishops had the same top five strengths in the exact same order as mine. Gallup reports that the likelihood of two people having identical top fives in the same order is 1 in 33 million! Clergy and congregations can best engage in the sacred dance of ministry when we take the time to discern our respective strengths and go from good to great in specific areas. Research is clear that focusing on a few profound strengths creates far better results than trying to be good at everything. Admittedly, this is a challenge for clergy, who are usually called to be generalists rather than specialists and are expected to be skilled in a variety of areas. Often, too much emphasis on problems and “opportunities for improvement” demoralizes the spirit of clergy and staff and prevents them from using their best qualities to soar. Our most effective clergy use their strengths daily by focusing on what they love and do best and relying on others to fill in the gaps where they have neither the passion nor the skills. The same applies to congregations. When local churches focus their ministries in specific areas where they are strong rather than try to do everything, they will be more effective in living out their mission and vision and making disciples. We have much to learn from new church starts, who need to decide at the very beginning what their DNA will be. The core group of a new church has the opportunity to shape its future through the collective strengths they bring and the subsequent ministries they offer. By contrast, a long established congregation has a greater challenge because deeply entrenched programs may appear at first glance to be strengths but are not really contributing to the growth of the congregation in numbers, grace, and spiritual depth. Every congregation should regularly engage in an evaluation of its ministries, which might include identification and retirement of self-serving “sacred cow” programs in favor of new initiatives that better reach the current needs of its community and use the gifts of newer members. A church I admire greatly decided to focus on two strengths: their significant property and a history of actively serving their community. Under the leadership of Pastor Andy, who excelled in cultivating community relationships, the congregation built baseball and soccer fields and a skate park on their property. They also organized youth leagues and built a concession stand. In addition, they opened a Free Store in town in cooperation with other area churches. Today this United Methodist congregation is known throughout the area as the church that cares about everyone. Why? Because by playing to their strengths, they are inviting others to play and serve together. I will use my strengths daily. Will you? We miss you! While I agree with you in principle I also think of my own faith journey. My times of greatest growth have occurred when I was asked to do something I felt unqualified to do. It created in me the need to depend on God for what I was about to take on. It reminds me of all the unlikely people God chose to carry out His plans and how reluctant many of them were because they, too, felt unqualified.